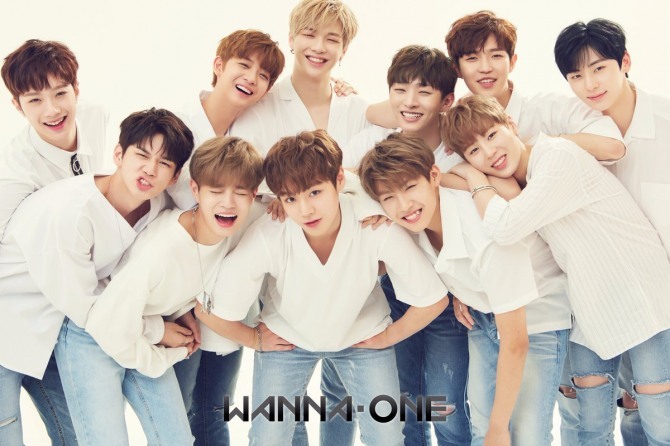 The K-pop boy band Wanna One will release a new album next month, its management agency said Tuesday. YMC Entertainment said the 11-member project group recently finished filming a music video for its new song and that the album will come out on March 19. The band posted teaser images titled "2018 Golden Age Begins," along with a statement that said, "It's not the beginning of the end. It is the beginning of the Golden Age," on its official Twitter account, raising expectations among fans about its return. In the images, members wore tattoos on their bodies that said, "Pot of gold," "Oath" or "Stay gold." Last week, it unveiled another set of teaser images in which members put on a golden ring. The boy band, comprised of 11 final winners of the popular survival reality show "Produce 101 Season 2" on music cable channel Mnet, was cherry-picked by TV viewers, whose votes amounted to more than 10 million in total. The band dropped its first album "1X1=1 To Be One" in August in one of the biggest debuts of any K-pop act. The album sold 741,546 copies and the repackaged album "1-1=0 Nothing Without You" sold 614,072 copies, a remarkable number for a debut album in K-pop history.